If you are a pVWc club member ask for a pVWc.org login. That login can be used anywhere you are asked for a Google Account login. 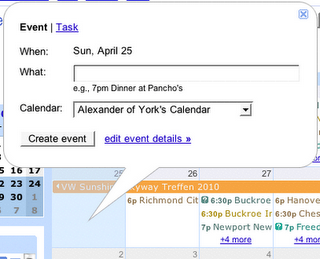 With a Google Account or a pVWc.org account you can have your own Google calendar. Google Accounts - http://www.google.com/accounts If you don't have a Google Account you can create a new account using your current email address even if it's not gmail. (You do NOT need to get a Google gmail,) Once created or if you already have a Google Account you can always add other (non-Google) emails that identify you to that same account and continue using the same Google resources. You may already have a calendar that will work for this like the iCal that comes with most Apple Mac computers or if you have an account with a domain that uses Google calendars (like pVWc.org) If not start your own calendar at http://calendar.google.com. Now once you have a calendar, you are able to create events in your calendar and send them to this calendars by putting the calendar's email address "Add guests" box. To see and edit the shared PeninsulaTeaParty.org calendar from your calendar click on "Add" under Other Calendars in the left side bar of your calendar and choose "add by url" then paste in this http://www.google.com/calendar/ical/gadmin%40pvwc.org/public/basic.ics or add a friend's calendar and use gadmin@pvwc.org in the email box. If you are using your @pVWc.org login you should be able to edit & add events to this calendar. You can embed the pVWc.org Calendar in your website or blog. Use our configuration tool to generate the HTML you need.